Figs grow on the Ficus tree (Ficus carica), which is a member of the Mulberry family. They grow best in areas of hot, dry summers and cool, wet winters. The majority of figs are dried, either by exposure to sunlight or in ovens, creating a sweet and nutritious dried fruit that can be enjoyed throughout the year. More than 60 percent of the water content content is removed in the drying process. As a result, dehydrated figs are a more concentrated source of calories, nutrients and fiber than the fresh variety. 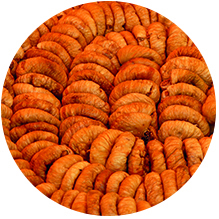 Dried figs are higher in vitamins, minerals and dietary fiber than the fresh variety. Figs are an excellent source of readily available energy. In raw desserts, smoothies, dried granola bars, raw energy bites or as a snack.